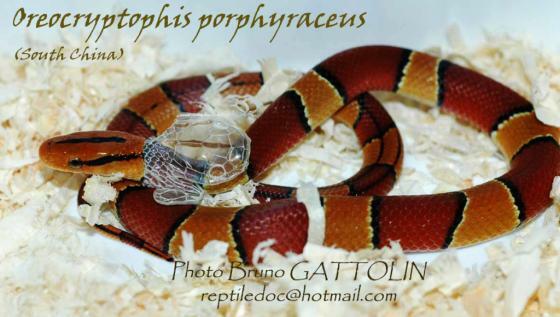 Can you confirm these amateur observations of Oreocryptophis porphyraceus? Holarchus vaillanti — MELL 1931: 211  ? coxi: NE Thailand; Type locality: Phuluang, Provinz Loei, NE Thailand, 850 m elevation. kawakamii: Taiwan. Type locality: Taiwan. laticincta: Malaysia (Cameron highlands, Pahang, West Malaysia). Type locality: Cameron highlands, ca. 1700 m elevation, near Brinchang, Pahang, Malaysia. hainana: People's Republic of China (Hainan). [currently considered as a synonym of O. p. vaillanti]. nigrofasciata: Hong Kong; Laos; People's Republic of China; Vietnam. Type locality: “Singapore”. pulchra: People's Republic of China (Yunnan, Gansu, Shaanxi, Guizhou); Type locality: Yunnanfu (= Kunming, Yunnan, China). Types Holotype: unknown (fide NGUYEN et al. 2009). Comment Subspecies: The infraspecific systematics of this species is controversial. 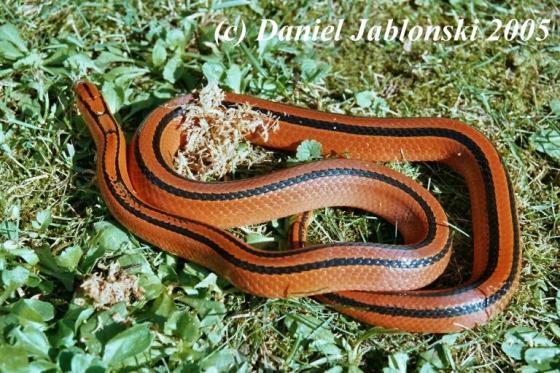 Zhao & Adler (1993: 238) considered Elaphe porphyracea kawakamii (Oshima, 1911) and Elaphe porphyracea pulchra Schmidt, 1925 synonyms of E. porphyracea nigrofasciata and E. porphyracea porphyracea respectively. According to this scheme, three subspecies are regarded as valid (E. p. porphyracea, p. hainana and p. nigrofasciata) and only the nominate form occurs on Sumatra. Schulz (1996) recognized not less than seven subspecies (see below), two of which are still unnamed, and refered the populations from Sumatra to one of these undescribed taxon that is being studied (Schulz & Helfenberger, in prep.). We follow Schulz (1996), but as this subspecies has yet to be named and defined, we provisionally refrain from mentioning any subspecific name for the Sumatran populations. Reported from but not listed for the Andaman Islands by DAS 1999. 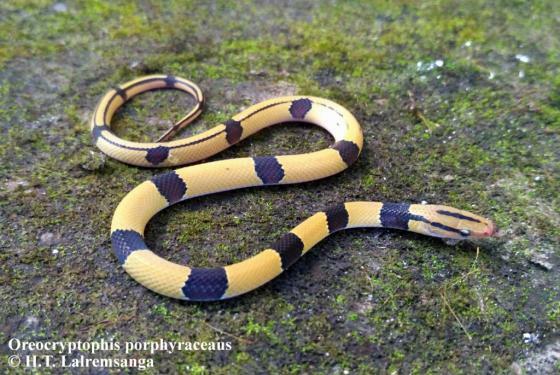 Variation: Oreocryptophis porphyracea is highly variable with red and yellow/black forms that may or may not have longitudinal stripes (see SCHULZ et al. 2010 for photos). 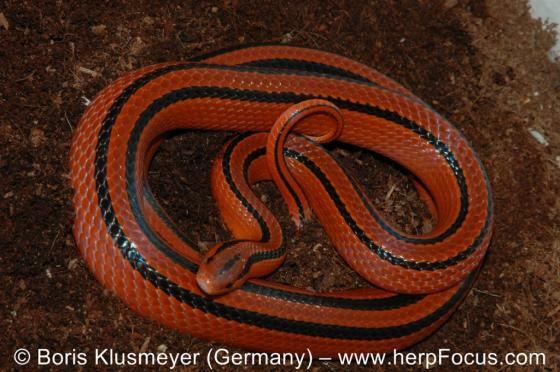 Type species: Coluber porphyraceus CANTOR 1839 is the type species of the genus Oreocryptophis UTIGER et al. 2005. 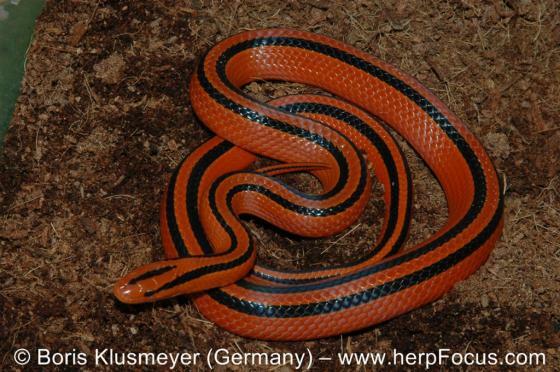 It is also the type species of the genus Oreophis UTIGER et al. 2002. 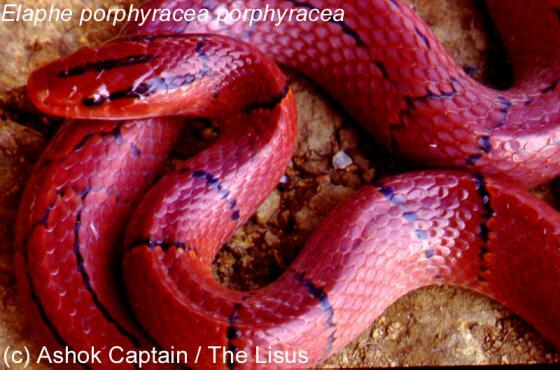 However, the generic name “Oreophis” is preoccupied by Oreophis boulengeri DUGÈS 1897, a synonym of Lampropeltis mexicana. laticinctus: Size: females 90-100 cm, males 75-80 cm. 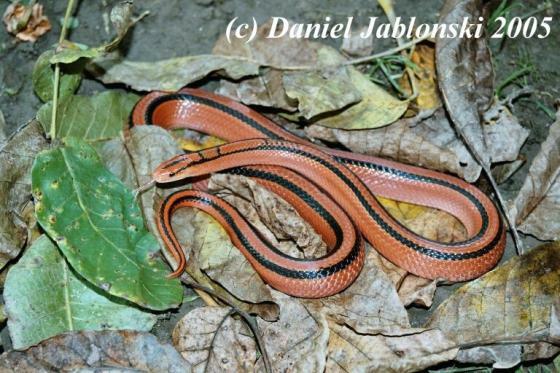 Adults are red with thin black bands while juveniles have broad red (or brownish) and yellow bands which are separated by thin black bands. 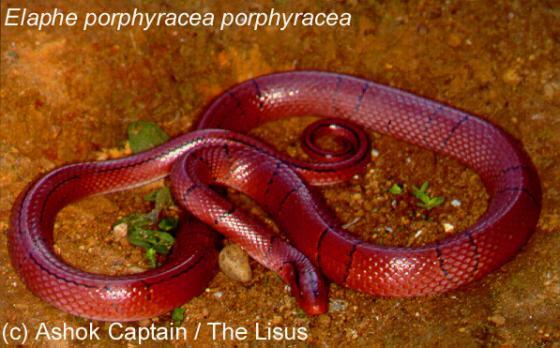 pulchra is a synonym of Oreocryptophis porphyracea porphyracea according to MARX 1958.
vaillanti: juvenile males are cross-banded while adult males have longitudinal stripes (see photos in SCHULZ & HELFENBERGER 1998). Etymology Etymology (genus): The new generic name alludes to the secretive way of live of Oreocryptophis porphyraceus in mountainous areas, and stems from the Greek words “oros”, meaning mountain, “kryptos”, meaning hidden or secret, and “ophis”, i.e., snake; the gender is masculine. This genus includes at least one species different from O. porphyraceus as averred by Utiger et al. (2002) and evidenced by unpublished mtDNA data. Oshima, MASAMITSU. 1910. 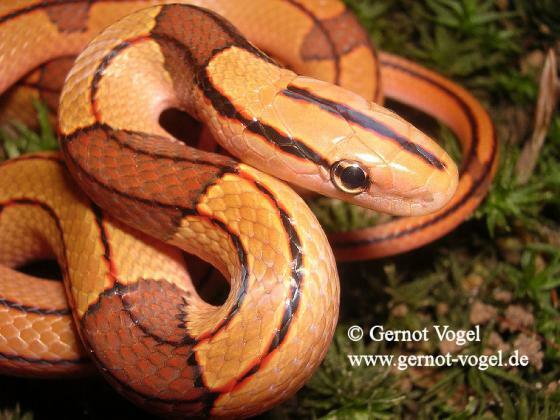 An annotated list of Formosan snakes, with descriptions of four new species and one new subspecies. Annot. Zool. Japon., Tokyo, 7 (3): 185-207. Werning,H. 2013. Entdecke die Reptilien. Natur und Tier Verlag (Münster), 56 pp.